This weekend, we visited Boston, the biggest city in the state of Massachusetts. Since it was the President’s Day Monday, February 19, we took the opportunity to go on a trip during the longer than usual weekend. It was only a 3.5-hour drive and it was definitely worth the time. None of us had high expectations about Boston. It is a city that you have heard of, but not so much more other than it is cold. But after our three day visit our conclusion is that it is a beautiful city which we definitely will visit again. 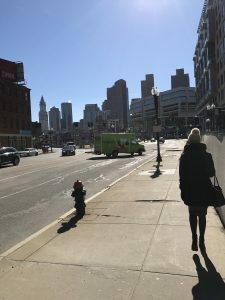 The impression we got was that Boston is more influenced by Europe than, for example, New York, since the buildings were very old (a good thing in our opinion) and had a more European touch to them. So, what did we do? Some of the things we did were strolling around the beautiful streets of Beacon Hill, some shopping downtown (Jessica’s idea), enjoyed each other’s company over a Swedish “fika” (Philip’s idea) and visited the famous Harvard University. A thing that is worth mentioning to all the shoppers, in the state of Massachusetts there is tax free shopping! So, if you want to get great bargains – visit Boston (or another town in Massachusetts)! To summarize this trip, we have an advice to all the readers of this blog. If you have the opportunity – go visit Boston! You will not regret it.